On Thursday, 24th July, the electric and telephone lines of the Burin Village were destroyed with a fire started by settlers from the nearby settlement of Yizhar. Thirty settlers arrived in seven cars and began to throw stones at the local people’s cars, in addition to starting the fire. The villagers called the Palestinian police, who alerted the Israeli police and army. 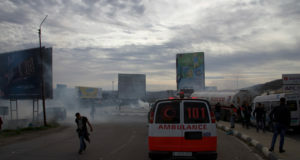 Once at the scene, the soldiers began to tear gas the Palestinians to disperse the crowd. One settler took a gun from a soldier and for a few minutes shot at the villagers. The settler will receive only a week-long arrest and the settler who started the fire will be briefly arrested as well. 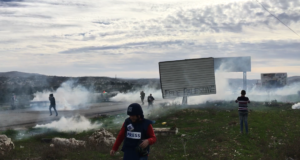 While no one in the village was injured during this attack, an ambulance had to give medical attention to a woman who inhaled too much tear gas. The electrical and phone networks had to be replaced by the village. The problems for the village began close to twenty-four years ago, but since 2005 the difficulties have severely worsened through daily attacks which vary in degree of damage. 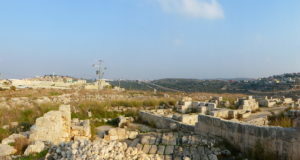 The village houses three thousand residents and is located between two settlments, Yitzhar and Abraha. Several members of the village council report that approximately five thousand olive trees have been cut or burned thus far, and multiple horses and sheep have been stolen.